This past Sunday I shared about an exciting new novel–so new it won’t be released until September. I described it as a novel that “Tells it like it is,” a familiar expression from the 1960s. Today I’m talking about another novel–again not due out for a while–that can be described the same way. Like The Breeding Tree, Voice in the Wilderness doesn’t pull any punches. Voice in the Wilderness isn’t a typical political thriller with some romance thrown in. It’s an all-too-realistic look at contemporary America and where we may be heading if we don’t wake up and do something about it before it’s too late. We have a self-centered liberal president who has ignored his oath of office time after time by showing his contempt for the Constitution. A president who piles executive orders upon executive orders to bypass the authority of Congress. And one who believes he’s smarter than the citizens of the United States. I won’t go so far as to accuse Mr. Obama of planning to create a national disaster that would—in his mind, anyhow—justify using martial law to control the nation and remain in power forever. But this book—fiction though it be—is a reminder that when the citizens of the United States fail to vote republic-loving people into office, anything is possible. I’ve read a number of good novels recently, but none that had the page-turner qualities Voice in the Wilderness has. The romantic elements helped to give the story balance. As I look back at what I’ve written about Voice in the Wilderness, I’m thankful that my First Amendment rights still allow me to voice my opinion freely and openly. If this story should come to pass, openness like mine would soon brand me as a terrorist. “Give me liberty or give me death.” And may Voice in the Wilderness not simply entertain its readers, but make them more conscious of what’s going on—and what could happen in the near future. If you get your news only from the liberal news sources, what I’ve said about Mr. Obama probably sounds like the worst of libel. But if you connect with Fox News or similar more conservative news sources, you’ve heard the other side of the story and understand where I’m coming from. What perfect timing that Voice in the Wilderness is coming out ahead of the next presidential election, even while candidates are jockeying for position in what will undoubtedly be the most important election in decades. Possibly ever. ARCS (Advance Review Copies) of H. L. Hegley’s Voice in the Wilderness are available. Although certain to contain minor mistakes, they don’t get in the way of the story. Go HERE to check them out. I pray that Voice in the Wilderness will make a number of readers start looking at what’s going on in America and take stock of what’s at stake and determined to make their votes count–no matter which side they’re on. This is a controversial subject. I don’t expect everyone who reads this post to agree with me. But if it makes you think, I’m satisfied. Please leave a comment if you’re inclined to, but keep it respectful. Thank you. 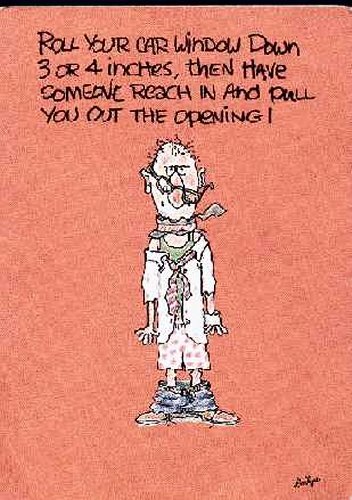 For some unknown reason I’ve been thinking about some of the great special occasion cards I’ve received over the years. Although I’ve had a number of good ones, these three stick out. Probably because they’re the only ones I still have. 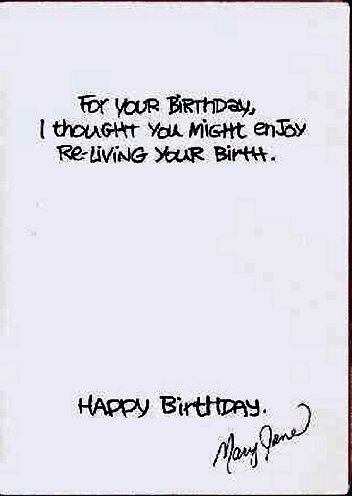 Shown above is a birthday card from Mary Jane Bolling, who was my department director for a few years while I was working at the International Mission Board. I was not only pleasantly surprised that she sent me a card at all, but especially so at its humor. I never fail to laugh when I look at it. Thanks again, Mary Jane, wherever you may be. 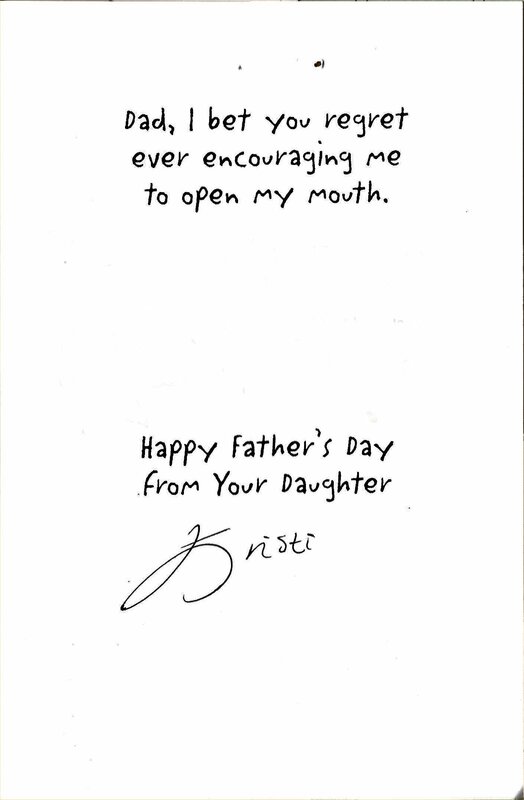 Next is a father’s day card from my daughter, Kristi, the summer after she graduated from high school. Within a few weeks, she was on the way to college far, far from home. I’ve edited out her personal greeting just because it’s between her and Kathleen and me. Nothing improper, though. 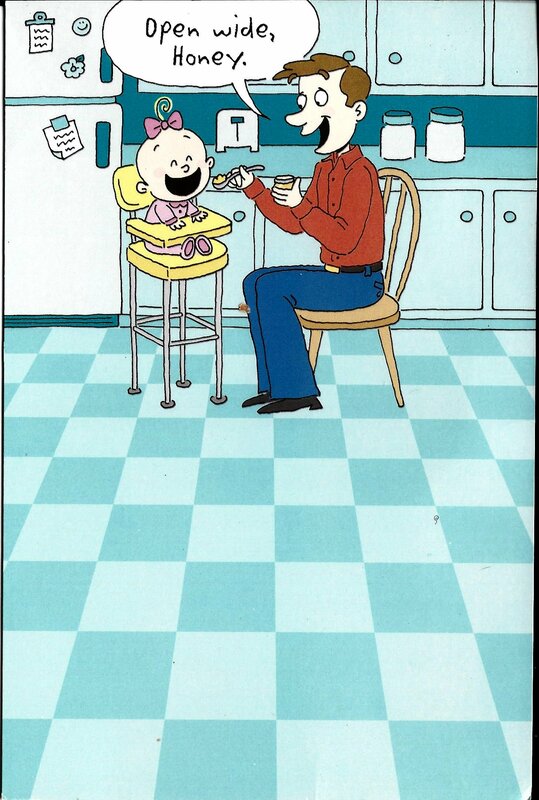 Thanks, Kristi, for that loving–and very humorous–card. 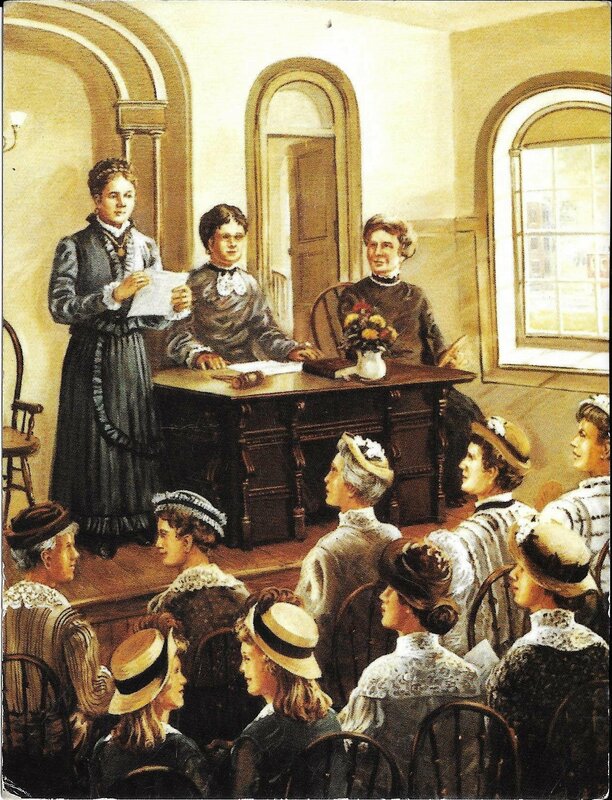 The third card isn’t a greeting card, but a postcard depicting the founding of the Women’s Missionary Union of the Southern Baptist Convention. Not quite as strange a thing for me to have and share as you might think. One thing my father shared with me often enough for me to remember is the fact that his mother and her twin sister attended the WMU’s founding meeting as little girls. So, yes, you really do see a set of twins there at the bottom left. Abby and Mariah, but don’t ask me which is which. What makes this all the more interesting (to me, anyhow) is the fact that the men were off meeting elsewhere, making a decision not to allow the women to organize. Ha! Didn’t work. 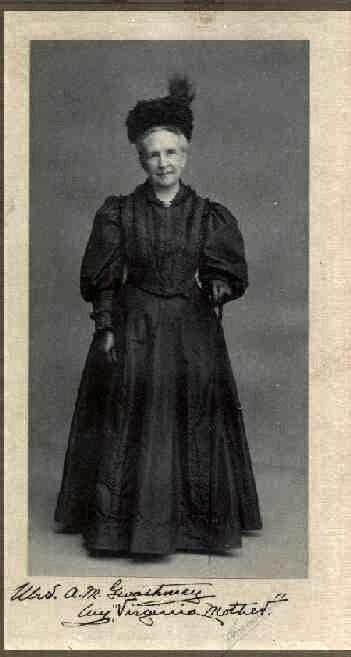 Abby Manly Gwathmey became one of the early presidents of the national WMU organization, and rumors are that the WMU would love to have that bed. I can’t imagine what it would cost to move something that huge and that heavy, but if they would be willing to foot the bill, we might be willing to give up this historical (and probably very valuable antique) heirloom to preserve it where it will be fully appreciated. What about you? Have you received (or perhaps bought for yourself) any special occasion cards or postcards? How about leaving a comment? For years I had an unfortunate and unconventional attitude towards lawn mowers. I’d buy the cheapest one available and use it till it quit working. I never did any maintenance except for adding oil–I never changed the oil–and occasionally replacing the spark plug. Not only that, I never drained the gas tank at the end of the mowing season. Why bother? It seemed like a nuisance. Because I kept the mower in a shed, it would normally last four or five years being (mis)treated that way. I rationalized that the replacement cost was about equal to the total of yearly tuneups by someone who knew (and cared) more about it than I did. Last year I started having real problems with the mower. It was acting even more sluggish than usual, and I had trouble keeping it running. No telling how often I had to restart it just to get the grass cut. As the end of grass cutting season approached, the mower had grown nearly impossible to start. Time for a new mower–just to get me through the last couple of mowings before cold weather. The new mower was different from the old ones, though. It came with a sample of gas additive and some important information about why I should treat the gas with it. It seems that the ethanol in regular gas turns gas to water over a period of time–like from one year to the next. I had been using a can of the previous year’s gas. Out of curiosity, I asked a mechanic friend’s opinion. Based on what I told him, he verified that the water in the old mower had probably done a serious number on the carburetor. Replacing it would have cost $75-85. In ignorance and laziness, I’d outsmarted myself. So I used the additive to finish last year’s mowing season, drained the gas just in case, and disposed of what was left in the can. I bought fresh gas this year and put the additive in it. Not only is the mower working great, it sounds and acts like new, which it almost still is! God didn’t design the human body to last forever, although proper care of the body is apt to add many additional years of life. But at the end, the body will die. The soul is something else, though. It’s eternal. Even so, it requires proper maintenance. It can get too easily overgrown with sin and concerns about this world. Not the way God intended for our souls to be. God has a special additive for the soul. If we read His Word, talk with Him in prayer on a regular basis, and worship with other Christians, God’s Holy Spirit can keep our souls functioning properly. We rely more fully on God rather than on ourselves and are less less inclined to give in to temptation. Taking advantage of the gasoline additive is my decision based on past experience. So is allowing the Holy Spirit to keep my soul sound. Is your soul in good working order or have you allowed it to grow unusable? You can’t replace your soul, but you can allow God’s Holy Spirit to work in your life and renew your soul and make it as good as new. What’s the Big Deal about Looking Our Age? People used to be surprised when I told them my age. They would invariably say, “You don’t look that old.” Now that sixty-nine is just a few months away, I’ve suddenly realized I haven’t heard that comment as often as I used to. At some point I must’ve started looking my age. What’s the big deal about that? Am I supposed to get a hair transplant or buy a toupee? I think not! I was bald long before I reached this age. It didn’t matter that much then, and it matters even less now. Should I color my hair–or at least darken my beard and mustache? That gray doesn’t look nearly as nice in photos. Nope on that, too. How many people are apt to study pictures of me and criticize the way my hair looks? If anything, they should note how nicely styled it is. It looks much better now than it did when I was younger. Wrinkles? If I have any, I haven’t even noticed them yet. I don’t expect to have anyone greet me sometime with a “Boy are you getting wrinkled!” How rude would that be. The problem would be theirs, not mine. Oh, my! Are my teeth white enough? Doesn’t matter. At least I have all but one of the ones I’m supposed to have, and the missing one doesn’t show. Although I wish my teeth were perfectly aligned–braces weren’t even discussed when I was growing up–I really wouldn’t want to put myself through that now, even if money weren’t an issue. Hmm. My arms look a bit flabby. Should I take up weightlifting now to do something about that? As if I don’t stay busy enough doing things I consider important. Okay, so I use a walking stick for my almost-daily walk. But it’s not because I need it to walk. It just helps me keep my rhythm better. When I need it to get around, I’ll already be almost used to the idea. By the time I got hearing aids–probably ten or eleven years ago–I was too concerned about wanting to hear better to worry about whether other people noticed them. Now that they’re starting to fail me, my concern still isn’t how they look, but how many important things am I failing to hear properly. As I look back at what I’ve written, I can only conclude that I might not win any prizes for my looks, but who cares? Not I. I’ve done a pretty good job of accepting myself as I am. And that includes looking my age. What about you? Do you look your age? Would you do–or DO you do–anything to make yourself look more youthful? How about sharing a comment? It’s no wonder I write quirky fiction. I’m a quirky person. Not dangerously so, I hope. Not yet, anyhow. Since my wife, Kathleen, loves to tease me about this particular quirk–she dares to call me obsessive about it–I decided to share it here. I’ll let you decide for yourself. Long before gas got so terribly expensive, I was a real Scrooge about wasting it. I haven’t changed. When I go to Sonic for my daily diet cherry limeade, I use the drive through. I didn’t used to, but I’ve moderated my habits a tad over the years. But that doesn’t mean I’m less economical. If there’s a car in front of me, I turn off the engine. Same if they don’t take my order the instant I stop at the intercom. And I turn it off again when I reach the pick up window. Each time the cars in front of me move, I start the car and move, too. Then I turn it off again. I don’t know if this is a fact, but I remember hearing back during those horrible days of gas shortages that if a car has to idle longer than a minute, it’s more economical to stop and restart it. Even if someone were to prove to me that my belief is inaccurate, I doubt that I’d change my habit. It’s too deeply ingrained. Let me assure you of one thing, however. I do NOT follow that rule at stop signs or traffic lights. Safety comes first. One thing I love about my Honda Civic is the equipment that shows me how economically I’m driving. One gauge shows blue if I’m being totally wasteful, teal if I’m only somewhere between wasteful and economical, and a nice bright green if I’m doing really well. In the first picture above, I’m not doing very well. Of course, maybe that’s because I had to stop in order to take the picture. The gauges don’t function unless the car is running. Kathleen took the second picture while I was doing seventy on the Interstate. Green and getting more than thirty-five mpg. Accelerating is tough. No matter what. A jack rabbit start–I’ll do one only for safety–is sure to be blue. But so is any and acceleration that’s not uber-gradual. I pay attention to whether I appear to be holding up whoever is behind me and may accelerate faster than I want to. There’s also a gauge that shows how many miles per gallon I’m getting at that particular moment. It’s such fun to coast downhill and see my car getting seventy mpg! (The gauge only goes to seventy.) And I’m always clicking the “I” button on the steering wheel to see what my overall average is for that tank of gas. People sometimes ask if I write about myself in my novels, and in many instances the answer is a resounding YES! In my yet-to-be-published novel, Impractically Yours, the female protagonist teases the male protagonist about having the exact same gas-economy practices I have. Did I mention that I rarely let Kathleen drive my car? That’s because she refuses to pay attention to what the gauges are telling her about how she’s driving. Doesn’t that explain why she likes to tease me so much? I told you I was quirky, didn’t I? Is there some characteristic of yours that others describe as quirky? Or do you have something to say about driving or being economical? How about sharing it with us in a comment? It makes me sick to hear of women having abortions because their unborn babies are deformed or handicapped in some way. If those women are even capable of love, giving the babies up for adoption would be the more humane thing to do. There are people in the world who have enough love to care for handicapped children. Much better for the children than growing up with parents who continually gripe because their handicapped children are “inconvenient” to care for. But what of babies who appear to be perfectly healthy and normal at birth, only to show signs of being handicapped months or years down the road? Do the parents cease to love them because of that? I would hope not, although I’m sure it happens in some instances. Gus pretended not to notice B.L.ZeBubb smiling gleefully at his mention of spiritual burnout. That couple’s self-sacrificing love for their daughter still inspires me. And it always will. Self-sacrifice? Isn’t that what love sometimes involves? How can you have love without at least a willingness to sacrifice? Probably the best definition of love I’ve ever heard is “wanting what’s best for the other person–and being willing to make whatever sacrifices are necessary to bring that about.” My friends’ sacrifices couldn’t change their daughter’s handicap. But they didn’t let her handicaps change them. They gave their all for her. Several Sunday nights ago, a young lady from my church who was barely out of her teens died from health problems that could not be cured. I barely knew her, and I don’t know her parents at all. But one thing I’m sure of. They know the meaning of sacrificial love. Ellen Masters, I’m thankful to have known you ever so slightly and to have had the privilege of praying for you for years. I’m sure your parents did everything in their power to keep you alive and return you to normal health. But, in this case, sacrificial love meant having to let go when nothing else would help. We believe you’re in God’s presence right now, whole for the first time in years. I look forward to getting to know you better when my time comes. I’m getting drowsy right now. Ready for my afternoon nap. But I felt the need to at least start working on this blog post. While I didn’t have a subject five minutes ago, I’ve kind of just yawned my way into one. Let’s see if it works. By this time of day, I’m normally ready for a change of scenery. After staying in the living room all morning (except for a ten-minute run to Sonic for a large diet cherry limeade, easy ice) five mornings of the week, that could mean getting outside. Cutting the grass. Picking up something at the grocery store. Checking out what’s new at Barnes & Noble. Taking a walk. Any of those activities would qualify as a change of scenery. But in my retirement years I’ve come to prefer taking a nap. A simple siesta on the sofa in the living room. With Happy–the happy miniature dachshund–snuggled up on my lap. Or between me and the back of the sofa, depending on how I’m lying. Getting to sleep isn’t normally a problem. I have relaxing music playing in the background, and that helps me tune the rest of the world out. Not counting phone calls, which I have little control over but a wonderful capacity for ignoring. No wonder. Practically none of them are personal. I don’t normally sleep long. Half an hour is normal and forty-five minutes is almost unheard of. These naps don’t usually leave me groggy, either, thank goodness, but they do leave me refreshed and ready to get something done. I remember too well when my daughter, Kristi, outgrew her nap-time as a child. Having her awake all of the time sometimes proved to be a real chore. At least I don’t bother anyone else whether I nap or not. I’m just thankful I can enjoy those snoozes and hope I never get too old for them. Until I take that final nap, anyhow. But I’ll be heading into the pearly gates of Heaven at the end of that nap. What about you? Do you enjoy an occasional siesta? Do you have a favorite day and time for one–for example, a Sunday afternoon nap? How about sharing with a comment? My newest novel, The Devil and Pastor Gus, is available at Amazon and Barnes & Noble. Go HERE for links to those places.